When The Girl who Played Go first came out in 2003, I read a review about the book and was intrigued. I vowed to keep an eye out for it. In those days one didn’t just automatically add a book to one’s Amazon Wish list. One liked to find books the old fashioned way, serendipity. One liked to stumble across them by accident in some far flung and obscure bookstore somewhere in the midwest, or northeast, or wherever. Years went by and I never saw the object of my desire. By then it was locked away in the recesses of my memory and I was no longer consciously looking for it at all. 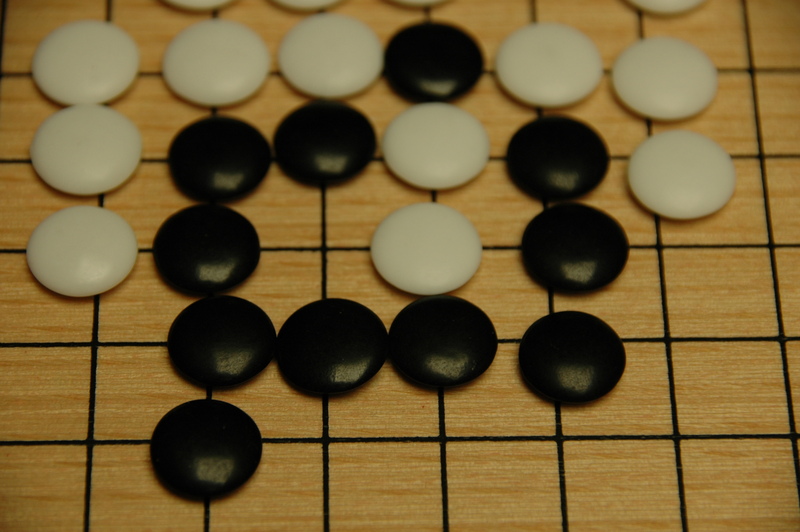 Then one day in, 2007, in a crowded book store in Philadelphia, I ran across a book entitled, The Master of Go. To my imperfect memory I thought this must be the book I had long sought. I picked it up, took it home and put in a shelf where it languished a few more years. When I finally got around to reading it, I thought, this is strange. This doesn’t seem like the book I had read about all those years ago. This book, written by Yasunari Kawabata, was about a modern day Go player, in Japan. While I enjoyed the book very much, it was a realistic depiction of an elderly gentleman who was a Go master and the rigors of tournament play in Japan. I read the book and put it away and started a new book and didn’t give the Master of Go another thought; until year 2012. I ran across another book on Go in Louisville, Kentucky at the Half Price Book store where I am wont to go. It was entitled, The Girl Who Played Go. Eureka! Sweet mystery of life, finally I found you! The Girl Who Played Go, written by Shan Sa, was my long sought after book. I immediately purchased the book and took it home and began reading. Friends it was worth the wait. Shan Sa has an extraordinary background. She was born in Beijing, started writing at seven and enjoyed success as a teenage poet. At 18 she moved to Paris to study philosophy. She worked for a time with the artist Balthus . Writing in French, she won a Goncourt with her first novel. Her novel, The Four Lives of the Willow won the Prix Caze. In 2001, she was again awarded the Prix Goncourt des Lycéens for her novel, The Girl Who Played Go. Her works have been published in 30 languages worldwide. Since 2001, Shan Sa has continued to write literature and paint. Her works have been shown in Paris and New York, and Japan. In 2009, Shan Sa was awarded by the French Cultural Ministry, Knight of Order of Arts and Letters. In 2011, she was awarded by the French President, The Knight of National Order of Merit. In these times of economic hardship it is particularly important to hold onto your money and stretch your dollars as far as they will go. For the householder with a family to consider budgeting is a must. The budgeting method I found that works best for me is zero-base budgeting. This method is the way I have run my personal finances all my adult life and it works really well. I first heard about this method when Jimmy Carter was president of the United States in the late 1970s. This is the type of budgeting he employed to balance the budget in Georgia when he was governor of that state and he also used it in the federal budgeting process once in the White House. Carter got the idea from Peter Phyrr, a manager at Texas Instruments, who originally came up with the idea of zero-base budgeting. Zero based budgeting was eliminated in the federal budgeting process in 1981, but elements remained in place throughout the Reagan, Bush, and Clinton administrations. When I was a manager in industry we also employed a type of zero-base budgeting, even though I had a traditional type of budget to work with. Money was so tight that we had to justify every dollar spent whether it was budgeted or not. If one department needed to spend some money on a piece of equipment, for example, the other departments were expected to help them out by not spending even if they had money to spend. The term zero-based budgeting differs in its meaning to different people. Some experts say that there should be zero difference between your income and your expenses each month. In this methodology, the individual starts with a blank page and lists all sources of income on one side and all their expenses on the other. A spread sheet is also helpful for this exercise. This will help you control every dollar earned and every dollar spent. From there you look at ways to reduce unnecessary or excessive spending such as eating out or buying clothes. The way I do it is a little less formal. I have it fixed in my head how much money I have to spend and I don’t spend a dime more than is necessary I justify every single expenditure. This method has served me well over the years and has allowed me to remain solvent even through the tough times. 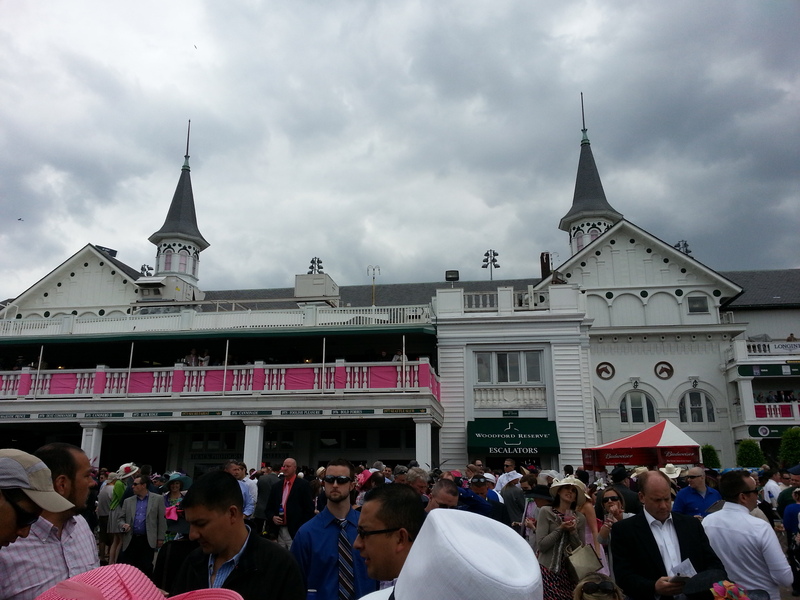 We studied the racing form and saw that there was a field of eight horses for the next race. Aunt Renie had never been to a race track before so I had to teach her how to handicap the race. I am not an expert myself but here’s how I do it. The first thing I do is to study the form for information listed about the horses in the racing form for that particular race. First of all I look for names I like. Something that clicks. Then I look at the stats on that horse. Who is the trainer, who is the jockey, how much weight does the horse carry, how many races did the horse win this year and last, what are the odds? The race was about to begin as was indicated by the trumpet call to the gate. I hurried back to where Aunt Renie was sitting and showed her our ticket. Just then the announcer announced, “They’re off!” and the race began. “In the lead was Solient Green, on the outside Gold Band. On the rail was Shiftless Joe followed by our horse, Psycho Blue Boots. Royal Pain was moving up to fourth place, Psycho Blue Boots makes a sudden move….They are in the turn, Royal Pain is in third. Psycho Blue Boots moving up on the outside…now moving in…in the stretch Psycho Blue Boots takes the lead… at the wire… Psycho Blue Boots wins by a nose!” he crowd goes wild. I go wild. Aunt Renie goes wild. We are winners! Next morning, I took Aunt Renie to the airport where she resumed her travels. Next stop, Amsterdam! The Spanish Civil War was one of the most decisive events of the 20th century. While the memory of this event fades into the background, reading this book brings it vividly back to life. One is transported in time immediately back to the trenches of the battlefields with their stench of human waste and long periods of boredom and sudden periods of danger and to the turbulent streets of Barcelona where rival factions fought each other for control of the Telephone Exchange Building. The importance of such a record would be difficult to overstate. As one reads the record of the events taking place in Spain, taken from Orwell’s direct experience, one cannot escape noticing the similarity to events taking place in America today in the 21st century. As Lionel Trilling indicated in his excellent introduction to the book, Homage to Catalonia is a testimony to the nature of modern political life. He observes that politics is a relatively new thing in the world, and we do not yet know very much about it. That is hard to understand nowadays, given the 24 hour news cycle and the complete immersion of politics on the cable news television stations. Ideas play a large role in politics and have great power. These ideas are directly connected to another kind of power that is described in the book: the power of force. In 1937, Orwell went to Spain to observe the civil war and to write about it. When he arrived in Barcelona, he got so caught up in the revolutionary furor that he decided to stay and fight. He joined the militia as private. The militia unit he joined by chance was a unit known as POUM (Party of Marxist Unification). The Spanish Civil war was a fight in defense of democracy against the Fascist enemy led by its chief proponent, Generalissimo Franco. There were many rival factions taking up the fight against the Fascists: POUM, communists, Trotskyites, and anarchists. We see some of these same echoes today in the Occupy Wall Street Movement. There are many and various factions protesting the inequality of the 1% of the wealthiest Americans versus the 99% of the rest. These inequalities have brought great unrest to our country along with high unemployment, economic hardship, and social injustice. The militaristic mien of the jackbooted SWAT Teams breaking up the demonstrators in Oakland, Boston, and New York are reminiscent of Franco’s fascist brigades. Orwell was quickly sent to the front to fight in the trenches. In trench warfare, according to him, five things are of paramount importance: firewood, food, tobacco, candles, and the enemy, in that order. The real preoccupation with both armies was trying to keep warm. Firewood was the only thing that really mattered. The trenches were more than 500 yards apart and in those circumstances no one gets hit except by accident. He describes a particular experience that eerily presages passages from 1984: “In the barn where we waited the place was alive with rats. They came swarming out of the ground on every side. If there is anything I hate more than another, it is a rat running over me in the darkness.” This articular horror is to found behind the doors of room 101. Barcelona is a town with a long history of street fighting. While on leave in Barcelona after serving three and one half months at the front, the last thing Orwell wanted was to be mixed up in some meaningless street fight. To be marching up the street behind red flags inscribed with elevating slogans, and then be bumped off from an upper window by some total stranger with a sub-machine gun- that was not his idea of a useful way to die. When Orwell saw an actual flesh and blood worker in conflict with his natural enemy, the policeman, he did not have to ask himself which side he was on. Completely innocent people were being arrested owing to police bungling. He reached the point that every time a door banged he reached for his pistol. Foreign journalists in Spain were hopelessly at the mercy of the Ministry of Propaganda, though one would think that the very name of this ministry would be a sufficient warning. Watching a fat Russian agent explaining that a particular event was an anarchist plot was the first time Orwell, according to his account, had seen a person whose profession was telling lies, unless of course, one counts journalists. One is reminded again of today’s Fox News which studies have shown its viewers to be the most uniformed. Its entertainers, posing as newscasters, have a way of stating their biased opinions as fact. The fighting began on July 18, 1936. Most anti-fascists in Europe felt a “thrill” of hope. Here at last was democracy standing up to Fascism. For years, the so called democratic countries had been surrendering to Fascism: The Japanese, Hitler, and Mussolini. When Franco tried to overthrow the center left government in Spain, the Spanish people rose up against him. Franco was not really comparable to Hitler or Mussolini. His rising was a military mutiny backed by the aristocracy and the Church. It was an attempt not so much to install fascism but to restore feudalism. The Spanish working class resisted by revolt. Land was seized by the peasants and factories were seized by trade unions. Churches were destroyed and priests were driven out or killed. In certain areas of revolt as many as three thousand people died on the streets in a single day. Men and women armed with sticks of dynamite rushed across open squares and stormed stone buildings held by soldiers with machine guns. Anarchists and socialists were the backbone of the movement. The entire issue had been reduced to Fascism versus democracy.